In the second-lightest volume trade of the year, the major indexes finished lower with the small caps of the Russell 2000 Index ($RUT.X) 775.81 -0.98% pacing the decline, while the mega-caps of the very narrow Dow Industrials (INDU) 13,403.42 -0.29% gave back a fraction of last week's 2.51% gain. For those that may not be familiar with the card game Texas Hold'em, it is a derivative of 5-card draw, or 5-card stud, where each player is dealt two cards face down, which only each player themselves can view. The game is divided into a series of hands or deals. At today's close, I think readers should envision the "flop" (dealer has turned three cards face up) and market participants (or card players) have decided to either play the next round, "the turn," or simply fold and wait for the next game. It has been my observation in recent weeks that the small caps of the Russell 2000 (RUT.X) have been the weakest of hands a bull could play, and headed into this week's FOMC meeting and closely scrutinized earnings reports from Lehman Bros. (NYSE:LEH) $58.62 -1.47%, Bear Stearns (NYSE:BSC) $115.38 -1.54% and Goldman Sachs (NYSE:GS) $187.61 -1.56%, last week's "lagging" to the upside, and today's "leading" to the downside in the RUT.X doesn't look overly bullish. One card the dealer turned up this morning drew a negative reaction in Microsoft (NASDAQ:MSFT) $28.73 -1.06%, which did weigh on broader technology. The European Union's second-highest court affirmed the EU's nine-year pursuit of the world's largest software maker, rejecting the company's appeal and strengthening the Euro-zone's hand as it pushes ahead with cases against other major technology companies. "The decision very clearly gives the Commission quite broad power and discretion," Microsoft lawyer Brad Smith said. "There are many companies in our industry that have a very large market share." He added that the 248-page ruling would actually affect "every other industry in the world." In Washington, Assistant Attorney General Thomas O. Barnett said the European ruling "may have the unfortunate consequence of harming consumers by chilling innovation and discouraging competition." "In the United States, the antitrust laws are enforced to protect consumers by protecting competition, not competitors," he said in a statement. "In the absence of demonstrable consumer harm, all companies, including dominant firms, are encouraged to compete vigorously." An additional card turned up in the "flop" was the regional NY Empire State Manufacturing Survey (September), which came in at 14.7. The 14.7 reading, while expansionary, was below the 18.0 consensus and prior 25.1 reading. The index is derived from a survey that asks respondents to rate the level of general business activity as "decrease", "increase", or "no change". Although this survey is limited to manufacturers in New York only, many pay close attention because the New York Federal Reserve releases it weeks before other major reports on manufacturing (e.g., Industrial Production, ISM Manufacturing Index). One bullish card I saw turned today had to do with merger and acquisition news. Remember months ago the plethora of M&A news and "Merger Monday" when the markets were seemingly awash with liquidity? Shares of defense aerospace/defense contractor EDO Corp. (NYSE:EDO) $54.84 +6.46% closed at another all-time high today after the company said it had agreed to be acquired by ITT Corp. (NYSE:ITT) $63.50 -1.22% for roughly $1.19 billion in cash. The value of the deal is based on the purchase price of $56/share and the 21.3 million shares EDO had outstanding as of July 31. Some analysts disagreed whether ITT's offer would spark a bidding war among other defense companies. Raymond James analyst Chris Quilty said in a note to clients it was very likely that rival bids by Lockheed Martin (NYSE:LMT) $99.41 -1.90% and General Dynamic (NYSE:GD) $80.48 -0.78% could help drive the takeover price higher, recommending investors purchase the stock below ITT's offer. Conversely, Stifel Nicolaus & Company analyst Troy Lahr said new bids would be unlikely given EDO's credit challenges and uncertainty over revenue past 2008. If nothing else, the new high from EDO gives me a transition to one of today's internal indicators where the NYSE's 5-day NH/NL ratio (see table above) does reverse back up into a column of X. With so many opinions on what the Fed will do with interest rates this week, and what type of market reaction will be found if the Fed does this, or that, one place I think traders and investors might be able to turn to this week is what the New Highs, or New Lows "say" about where the markets are headed. Institutional traders, especially investment houses, will monitor variations of the NYSE new highs and new lows. For longer-term investors, they'll focus more on the 10-day NH/NL ratio (depicted by O and X on the above chart). For shorter-term to intermediate-term traders, I show a "f"ive-day NH/NL ratio, where at today's close, we do see a 3-box (from 30% up to 36%) reversal. On August 22, 2007, the "f"ive-day NH/NL ratio did give a "buy signal" at 16% (exceeded a 14% measure inflection high from 8/09/07). When I look at the above point and figure style chart of the NYSE 5-day and 10-day NH/NL ratio, it is the 5-day (f) that may help give us the observation of a "range," where going forward, further BULLISH LEADERSHIP could be found should the 5-day NH/NL ratio move further higher to 40%, while BEARISH LEADERSHIP unfold at a 5-day NH/NL ratio of 28%. It would be LIKELY that the 10-day NH/NL ratio (X,O) follow the 5-day. With that said, let's take a look at the very broad NYSE Composite ($NYA.X) 9,607.75 -0.68%. I'm going to "mark" the not only the 8/22/07 close (when the 5-day NH/NL ratio gave the buy signal), but I'm also going to mark the 8/09/07 close. You can "count the bars" on the NYSE chart above and see that the NYSE Composite ($NYA.X) trades just higher than it did 5-day's ago. When I look at the NYSE 5-day NH/NL measure (f), perhaps you can see the IMPORTANCE of what plays out over the next five sessions. What I do this evening is view an further PRICE strength and a NYA.X CLOSE above 9,700 as BULLISH, with the 5-day NH/NL ratio giving a second "buy signal" at greater-than, or equal to 40.00%. I would have to think that a CLOSE BELOW 9,499 is BEARISH and would likely have the 5-day NH/NL ratio "confirming" such price action with a measure of less-than, or equal to 28.00%. In Friday's OptionInvestor.com Market Monitor, I also laid out some NYSE new high and new low "benchmarks." The greatest number of new highs found on the NYSE since the "reversal up" has been 70 on 09/12/07. The greatest number of new lows has been 133 on 9/10/07. The reason I focus on the NYSE NH/NL internals is that this broad group of stocks is what institutions tend to "buy and hold" when they see fit. When they are SOLD, that gives many the observation that BIG MONEY is SELLING. NASDAQ-listed stocks tend to be "traded" stocks, thus we will associate them as being more volatile. Volatile stocks tend to be TRADED, not bought and held. I don't have too much further to add to last Monday's Market Wrap regarding the S&P 500 ($SPX) chart. One development that has taken place was a "doji" (where open and close is equal) that was created last Wednesday (09/12/07) when the SPX closed 1,471.56. Technicians (those that rely on charts) as part of their market analysis (like myself) will view a "doji" as some type of market equilibrium, where buyers and sellers have agreed on PRICE. Not today's SPX low of 1,471.82. On Thursday, PRICE resolution was to the UPSIDE of the "doji," and a very subtle hint that demand might be outstripping supply. However, BUYERS (demand) couldn't quite close the deal above 1,485. One internal indicator I have a very close eye on right now is the S&P 100 Bullish % (BPOEX) from Dorsey/Wright and Associates. This would be an INTERNAL measure of supply/demand regarding the BIGGEST 100 of the S&P 500. At the time of this writing, I do not yet have today's action update from the institutionally followed Dorsey/Wright and Associates regarding the S&P 100 Bullish % (BPOEX). However, as of Friday evening's close, of the 100 point and figure charts (supply/demand) in the narrow but BIG cap S&P 100, 67% of the point and figure charts were showing a "buy signal," while 33% were still on a "sell signal." On August 16, just 39% of these 100 stocks (39 of the 100) still had a buy signal associated with the chart. On 8/17/07 the BPOEX would have reversed up to "bear correction" status. Should we see a net gain of 1 stock, or 1%, this narrow, but BIG cap market index would achieve "bull confirmed" status. Here's a point and figure chart of the S&P 100 (OEX.X) on a conventional 5-point box chart. The OEX is trying to work its way ABOVE the bearish channel (just a 45-degree angle). We can easily "tie" the S&P 100 Bullish % chart and the OEX chart together and see how the recent addition of reversing "buy signals" has the OEX itself looking strong. From a pure supply (O) and demand (X) picture, the OEX can be BOUGHT with a STOP at either 670 (where O would exceed prior column of O). Further sign of strength would be another "buy signal" (first buy signal was at 690, when column of X exceeded prior column of X) at 700. I do remain rather cautious from both the BULLISH and BEARISH point of view. I do think traders and investors alike are best served to be BULLISH larger-cap names, and NARROWER indexes like the Dow Industrials (30 BIG CAP STOCKS), or S&P 100 (100 BIG CAP STOCKS), or NASDAQ-100 (100 BIG CAP NON-Financial) stocks. I would avoid, or trade BEARISH the smaller-cap index, such as the Russell 2000 ($RUT.X), and a security like the iShares Russell 2000 (IWM) $77.23 -1.10% is an ETF (electronic traded fund) that traders/investors will utilize for small-cap exposure. Here is a very quick snapshot of where the major global equity benchmarks stand at tonight's close, as well as some of the major currency relationships. In some of my Monday evening Market Wraps, I've been showing the above table of global equity index benchmarks. At the far right of the table, I'm showing an approximation of what would be the "Q3 to Date" percentage gains and losses. Is a "global recession" upon us? I would have to say that China's HangSeng and Shanghai certainly don't depict some type of global economic slowdown. One item that is rather "clear" is how Japan's Nikkei-225 shows an 11.13% decline so far this quarter. And we will note that the US$/Yen shows the dollar WEAK against the yen, which could be viewed as a NEGATIVE for Japanese exports to the U.S. We can also see the Euro/Yen showing the euro WEAK against the yen, which here too could be viewed as a negative for Japanese exports to the Eurozone. AAPL displayed relative strength this morning and rallied past resistance at the $140.00 level. Our suggested triggered to buy calls was at $140.25 so the play is now open. Unfortunately, the stock was unable to maintain its gains thanks to a generally wary market ahead of tomorrow's FOMC meeting. Another move over $140.00 or $140.60 (near today's high) can be used as a new entry point but readers might feel better waiting until after the FOMC meeting's decision on interest rates. We have two targets. Our first, more conservative target is the $144.75-145.00 range. Our second, more aggressive target is the $149.00-150.00 range. We do have a very wide (aggressive) stop loss because the markets and AAPL have been so volatile. Readers are strongly encouraged to find their own stop loss placement that best suits their risk level. We will note that the technicals are somewhat mixed but the P&F chart is still bullish with a $180 target. We do not want to hold over the mid October earnings report. Investors were cautious ahead of the FOMC meeting and the semiconductor sector hit some profit taking on Monday. BRCM lost 1.8% and broke down under its 10-dma, which is short-term bearish. A bounce near $34.00 could be used as a new entry point but an alternative entry would be to wait for a new rally past $36 or $37. Our target is the $39.85-40.00 range. The Point & Figure chart is bullish with a $49 target. Everyone is waiting for the Fed meeting tomorrow while the financial stocks are also looking to see what LEH has to say about their quarterly earnings and sub-prime exposure. LEH reports tomorrow morning and could set the direction for financials. We're suggesting call positions in C right now. You might want to wait until after the Fed meeting or until after C can clear the $47.50 mark. Our initial target is the $49.85-50.00 range but we might decide later to add a more aggressive target at the 200-dma. IBM continues to under perform and shares have broken what should have been round-number support at $115 and are heading for what appears to be short-term price support near $114.00. There is also potential technical support at the 50-dma near $113.20. Unfortunately, our stop loss is a little tight and more aggressive traders might want to put their stop under $113.00. We don't see any changes from our weekend comments. The MACD has now produced a new sell signal. RSI looks weak. The daily chart is starting to look like it has produced a bearish double top pattern. More conservative traders may want to bail out early and wait for a breakout to new highs before considering new positions. We're not suggesting new positions at this time. The stock has already hit our $118-120 target range. Our second, more-aggressive target is the $124.00-125.00 zone. FYI: The Point & Figure is very bullish with a $177 target. We don't see any changes from our weekend comments on MTW. The stock churned sideways ahead of tomorrow's fed meeting. Our post-split target is the $44.00-45.00 range. Our post-split stop loss is $37.48. The Point & Figure chart is forecasting a $56 target. Ouch! SYK lost over 4% today. The stock plunged right at the opening bell and never recovered. Making the day even more frustrating was the lack of news behind the big decline. Fortunately, we are still just spectators at this point. It was our suggested strategy to buy calls on a breakout to new highs with a trigger at $70.65. The stock opened at $69.69 and never looked back. We'll keep SYK on the play list for now in case it can recover. If triggered at $70.65 our target is the $74.90-75.00 range. Given the length of SYK's consolidation we would actually aim higher, maybe the $77.50-80.00 range, but we don't have much time and plan to exit ahead of the mid October earnings report. The P&F chart is bullish with an $83 target. Today's minor decline in TGI looks like relative strength to us. The temptation to do some profit taking after Friday's big move in the stock should have been huge but TGI managed to hold on to the vast majority of its gains. Shares traded sideways in a 75-cent range for most of the session. We had two targets on TGI. Our first target has already been hit in the $79.75-80.00 range. Our second target is the $82.50-84.00 range. We would not suggest new positions at this time. FYI: The latest data puts short interest at more than 13% of the 16-million share float. That's a high degree of short interest and raises the risk of a short squeeze. TMA trended lower ahead of the Fed meeting tomorrow and shares closed down over 3% albeit on very light volume. We would use the dip as a new bullish entry point. If you're the patient type then look for another dip toward $12.50 or the 10-dma near $12.80 as an entry point. One potential risk is LEH's earnings tomorrow morning. If LEH says something nasty about their sub-prime exposure then TMA could get wrongly painted with the same brush and shares could sell-off in error. We have two targets for TMA. Our first target is the $16.25-16.50 zone. Our second target is the $17.50-19.00 range. The P&F chart has reversed into a new buy signal with a $19.50 target. We do not want to hold over the mid October earnings report. ASH actually pierced resistance near $60.50 and its 50-dma on an intraday basis on Monday. The move probably hit a few stop losses but not enough to spark any major short covering. The stock pared its gains and overall it looks like a new entry point for shorts. However, we would wait until after the Fed meeting to re-evaluate any new positions in ASH. We have two targets. Our first target is the $55.15-55.00 range. Our second target is the $52.65-52.50 range. The good news in AYI today was the lack of follow through on Friday's bullish reversal candlestick pattern. Shares look poised to trend lower. However, the market reaction to the Fed meeting could change everything. It is strongly suggested that readers do a little profit taking of their own before the Fed meeting ends. At this time we're not suggesting new bearish positions. We have two targets. Our first target is the $47.75-47.50 range. Our second target is the $45.25-45.00 zone. We do not see any changes from our weekend comments on WHR. We warned readers that the stock would likely trade sideways ahead of the FOMC on Tuesday. Technically a failed rally under $92.50 or a new decline under $90.00 could be used as a new entry point for puts. We have two targets. Our first target is the 87.75-87.50 range. Our second target is the $85.00-84.00 range. The P&F chart is bearish with an $87 target. It's the same story, different stock. X traded sideways as the market waits for the Fed decision on Tuesday. At this point we would not suggest new put positions with X above $89.00. We do have a wide stop loss because the market (and the stock) has been somewhat volatile. More conservative traders may want to adjust their stop loss to something tighter. Crude oil spiked to another new all-time high today. We're waiting for a reversal and a breakdown in the XLE. We doubt that many of the speculators want to take possession of their oil futures so the commodity should see some heavy selling in the next couple of days. We are suggesting that readers buy puts on the XLE to capture any correction in oil. However, we're going to list a trigger to open positions at $71.15, which is just under the 10-dma. More conservative traders could put their trigger under the $70.00 mark and the 50-dma. If the play is triggered at $71.15 our target is the $65.50-65.00 range. An alternative target could be the rising 200-dma (currently near $63.80). Today was our one day to open strangle positions ahead of AZO's earnings report tomorrow. Wall Street expects a profit of $3.25 a share. We listed this play using September options, which expire after Friday. Given our brief time frame we labeled this an aggressive play. We listed two strangles. The first strangle was with the September $115 calls (AZO-IC) and the September $105 puts (AZO-UA) with an estimated cost of $2.50. We want to sell if either option hits $3.85 or higher. Our second combo suggested the September $120 calls (AZO-ID) and the September $100 puts (AZO-UT) with an estimated cost of $0.95. We would sell if either option hits $1.85. Tomorrow is the big day for BSC. Earnings should be out tomorrow morning before the bell. Wall Street expects a profit of $1.98 a share. We're not suggesting new positions at this time. Currently our strangle involves the October $115 call (BSC-JC) and the October $95 put (BVD-VS). Our estimated cost was $9.50 and we want to sell if either option hits $14.00 or more. The company is expected to report earnings on September 20th. This should be considered a more aggressive play. FYI: Last week we switched our strangle from September strikes to October strikes due to a move in BSC's earnings report date. If you're holding the September strikes it might work out. They were the Sep. $115 calls and Sep. $95 puts. Our estimated cost was $4.40. We wanted to sell if either option hit $7.85. Tomorrow is also the big day for the major indices. We're expecting some big moves after the Fed's decision on rates and their comments on the economy. We're not suggesting new plays at this time. Our DIA strangle play suggested using the September $137 call (DAZ-IG) and the September $127 put (DAW-UW) with an estimated cost of $2.05. We want to sell if either option rises to $3.10 or more. We have four trading days left before September options expire. Here's another strangle play on the DJIA using the DJX index. We're not suggesting new positions after the Fed meeting tomorrow. We listed two separate strategies. Our September strangle suggested the September $137 calls (DJY-IG) and the September $132 puts (DJW-UB) with an estimated cost of $1.25. We want to sell if either option hits $2.00. Our October strangle suggested the October $137 calls (DJY-JG) and the October $132 puts (DJW-VB) with an estimated cost of $4.75. We want to sell if either option hits $6.75. Tomorrow morning is the moment of truth for LEH. The company announces earnings and Wall Street expects a profit of $1.52 a share. We're not suggesting new positions at this time. This is an aggressive play since the September options expire in four days. We suggested the September $65 calls (LES-IM) and the September $55 puts (LES-UK). Our estimated cost was $1.55. We want to sell if either option hits $2.50 or higher. We are expecting some big moves in the OEX after tomorrow's Fed meeting. We're not suggesting new positions at this time. Our strangle strategy suggested using the September 700 call (OEZ-IT) and the September 660 put (OEY-UL) with an estimated cost of $14.30. We want to sell if either option rises to $21.45 or more. Considering these prices we probably need to see a move into the $705-710 range or the $655-650 zone to be profitable. The XLF should see some movement on both the LEH earnings news and the Fed meeting tomorrow. We're not suggesting new positions at this time. We're going to be aggressive and suggest the September options, which expire in five days. You might want to reconsider and check out the October strikes. 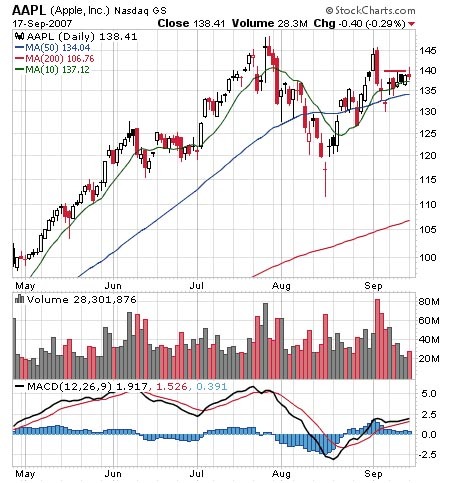 Our suggested strangle used the September $35 calls (XLF-II) and the September $33 puts (XLF-UG) with an estimated cost of $0.65. We want to sell if either option hits $0.95 or higher.